Died of spotted fever (usually caught from ticks) at Etaples on Tuesday 24th July 1917. Herbert is buried in the Etaples Military Cemetery. 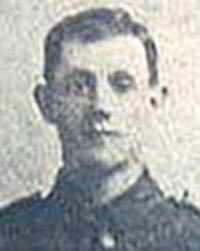 Herbert was born and enlisted in Belper. He was married to the daughter of Mr and Mrs George Blount of Penn Street Belper. His wife received notification of his illness and was granted a pass to visit her husband in France, she was at his bedside when he died and stayed on to attend his funeral. Prior to enlistment he worked at Ambergate Wireworks.